VAVUNIYA, Sri Lanka, Oct 18 2012 (IPS) - Mamaduwa, a remote village in Sri Lanka’s northern Vavuniya district where scorching winds blow across parched earth, is trying to forget the past. Comprised of 130 families, Mamaduwa lies on the southern border of Sri Lanka’s former war zone, popularly known as the Vanni. The village is almost entirely Sinhalese, the island’s majority ethnicity. 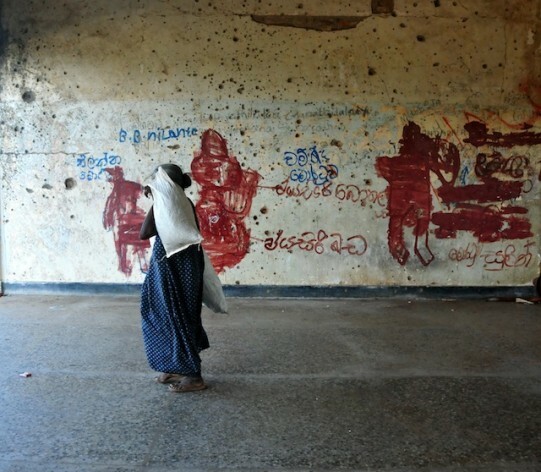 When ethnic tensions gave way to full-blown civil war in 1983, this small village found itself caught in the crossfire of a separatist conflict between the Liberation Tigers of Tamil Eelam (LTTE) – who were demanding an independent state for the minority Tamil community – and the Sinhala-Buddhist government of Sri Lanka. In 1985, a woman and her child were killed by suspected LTTE gunfire close to the Mamaduwa reservoir, igniting a mass exodus that emptied the village in a matter of years. Since the guns fell silent in May 2009, villagers have been trickling back in, but three years into peacetime they are yet to see an improvement in their lives. “We are happy to be back in our own village, but there is nothing else to be happy about,” 25-year-old Sagara Sampath, who spent two decades as an internally displaced person (IDP), told IPS. Sampath, at least, has a job with the civil defence force, which guarantees him a monthly salary. But other villagers are not as lucky, particularly because the mega development projects popping up throughout the former war zone have skipped over Mamaduwa. Most of the villagers here make a living by farming, though a harsh drought across the country has brought cultivation to a near complete halt. Still, even when harvests are plentiful – as they were six months ago according to Sampath – farmers find themselves struggling to survive. “This land is fertile, nothing has been planted here in the last 20 years, so even without any fertiliser, a good harvest is a guarantee,” Sampath said. But a bumper harvest doesn’t necessarily mean bumper profits. The faulty road system, which excludes Mamaduwa from easy access to local markets, allowed transporters and wholesale buyers from Vavuniya town, 30 kilometres away, to drive down the prices of farm produce. “If the roads were (better), we would have been able to save some money,” Sampath said. The problem extends beyond a dearth of transportation facilities, electricity, schools and health centres in the interior areas of the island’s former war zone. Jobs, too, are scarce. The Central Bank recently stated that the North was one of the country’s fastest-growing regions between 2011 and 2012 – achieving double-digit growth rates as high as 27 percent after the war. But early this year a joint survey by the United Nations Children’s Fund (UNICEF), the World Food Programme and the Ministry of Health found that over 37 percent of the population in the Northern Province listed daily labour as their main source of income. Economists point out that the main reason behind the province’s high growth rates is the introduction of major infrastructure projects like roads and electrification. That trend, according to economist Muttukrishna Sarvananthan, principal researcher at the Point Pedro Development Institute based in northern Jaffna, is not helping job creation. Sarvananthan told IPS most development projects are reliant on technology or heavy machinery rather than labour, which is abundant in the north. “In a post-war geographic area where the educational and skill levels of the local population – especially of the youth – are low, it would have been prudent to deploy labour-intensive construction methods,” he said. To make matters worse, large companies and investment firms have been reluctant to physically set up facilities in the former war zone. The only major exception appears to be MAS Holdings, a large international apparel supplier that is setting up three factories in the Vanni. Anush Wijesinha, an economist with the Institute of Policy Studies, also blames the employment deficit on the lack of incentives given out to local small and medium-scale enterprises, which could boost growth across the region. Public officials in the region told IPS that the government has recognised the slow pace of social empowerment, and has taken adequate steps to improve the situation. Roopavathi Ketheeswaran, the top public official in the Kilinochchi District, told IPS that vocational training facilities for youth were being set up in the region, with an eye on providing manpower for long-term reconstruction efforts. “Special steps have been taken to engage the youth in the development process. Vocational training is provided to many youth,” she said. Robert Peiris, the additional secretary at the North East Reawakening Programme, which operates under the ministry of economic development, agrees that one of the ways to break the employment jinx is to work with the available labour force. “For that, we need time to develop workers’ skills,” he pointed out, adding that the ministry is indeed paying close attention to the skills required for the construction sector. “If we can impart these skills, the trainees can find jobs even outside the region,” Peiris said. When Tamil leadership is not corporation with the government what progress you can make. Yet the government has been developing the infrastructure of whole land. Though the LTTE and the silent Tamilian population did the damage to country economy Tamils are not penalized any way. During the LTTE rule the main slogan was how can Tamils give information to the government of illegal activity of its people because of the fear on the LTTE cadres. What is preventing them from corporation with the law enforcement officials now? The Tamil leadership is running round the world rabble rousing. This got to stop if the government has to play even. The TNA knows by getting government discouraged they can go to Tamil people and influence them to work against the government. When TNA has not reported a single incident of stockpiling of weapons in tiger controlled area during the past they should not be trusted for any power devolution. THE AUTHOR MUST BE BLIND, OR IGNORANT NOT TO SEE THE PROGRESS. IF YOU ARE LONGING FOR LTTE TO RETURN THEN THERE IS NO PROGRESS. ECONOMY AND LIVELIHOOD IN THE COUNTRY PROGRESSING VERY WELL. JUST TAKE YOUR COLOURED GLASSES OFF YOU WILL SEE BETTER. have a heart Kaputa, the author has to work for the money he gets from foreign NgOs and he puts his name to their script.